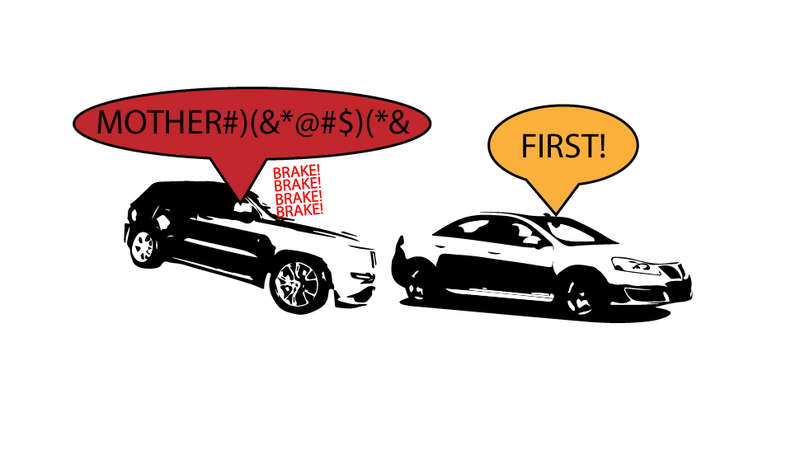 Will autonomy erode our ability to ‘beat’ the other guy? On my way to work this morning a woman in a Pontiac G6 cut me off, beating me to the already-red light and managed to set off my Jeep's rather frightening BRAKE-BRAKE-BRAKE alarm. After contemplating if Launch Control would give me enough squat to plant my front wheels on the trunk of her government-issued G6, I had an interesting thought: how will our tenacity to get ahead of the other guy sit with the programmed rules of self-driving cars? Our personalities, like our driving behaviors, are uniquely our own. Self-driving cars will prevent costly and deadly crashes, but that comes at a cost - our motoring self-expression. I'm not talking about what we drive, but rather how we drive. As humans we make incredibly stupid mistakes like racing to a yellow light or darting between cars on the highway to make an exit. We voluntarily make bad decisions. Too many of the self-driving naysayers say that people are afraid to give up control to a machine, but that notion is misguided. We humans don't fear robots, we fear losing the ability to make stupid, self-serving decisions while behind the wheel. If we placed the same woman in the G6 in a self-driving vehicle she has to make a choice: take her hands off the wheel and do something else (read, text, makeup, etc) or grab the wheel and continue driving like a maniac hoping she gets ahead of the next person. Some drivers prefer to stay in the right lane and do the posted limit while others need to do 15-over in the passing lane. A handful of motorists want to meander in-and-out of traffic in a dangerous game of automotive Frogger, while others are content sailing along in the same lane for the duration of their journey. These are all unique choices made by each human driver, bad or good, we make them. This lead me to the title of this post, will autonomy erode our ability to ‘beat’ the other guy? Are drivers willing to give up the ability to be first at the red light or to jump in the faster line of traffic just to read text messages or shave or whatever it is other people do while the rest of us are actually driving? If every time G6 girl gets the urge to get ahead (read: make stupid decision) she takes the wheel, the benefits of self-driving are lost and we're back to being the careless, dangerous, self-serving humans that we are today.